Get ready for the best year yet with custom back to school apparel! There are so many reasons why you should customize tees, jackets, bags and so much more for the upcoming school year. First off, it’s always easier when designing custom apparel from Customized Girl. You can customize our designs any way you’d like and create a design that’s totally unique to you. This is the best way to guarantee you won’t be wearing the same outfit as anyone else at school. Easily create a unified look for student activities, fundraisers, and sporting events. 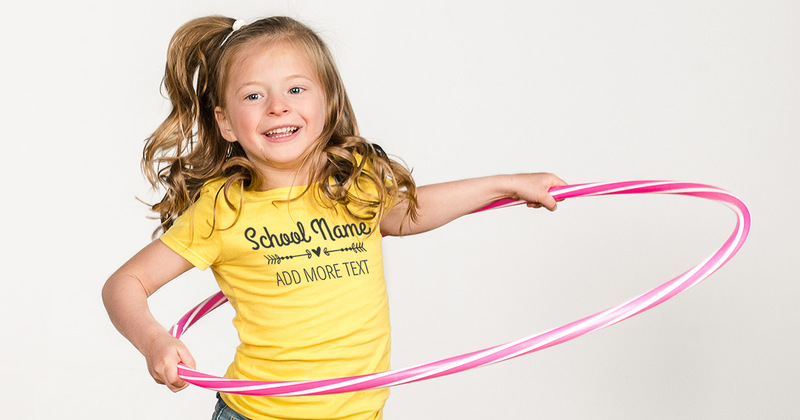 Personalize one of our existing designs to match your school name and colors or you can start with a blank design by adding your own idea, graphic or logo for a truly unique shirt. Our gallery is full of all your custom back to school apparel needs. Backpacks, letterman jackets, and hats – you name it and we’ve got it. Customized Girl even has apparel for your whole family to cheer you on from the stands! No minimums and group discounts. Our “no minimum” policy is something we are quite proud of because very few custom apparel websites match us in this offer. Almost all of them have a minimum quantity of at least six on most of their items. This is because those sites will only offer screen printing as an option for those items. As soon as you add 6 items to your cart, group discounts automatically kick in.Unlike screen printers, they don’t have to be identical. Discounts are applied to any 6 items or designs. With every new item you add to your cart, the discount will get bigger, and the price will drop. Amazing, right? Best, Year, EVER! Start the year off in style with custom back to school outfits & accessories sure to make varsity!